Healthy, hearty, quick and easy with an incredibly creamy buttermilk ranch dressing that is absolutely to die for! To make the buttermilk ranch dressing, whisk together buttermilk, Greek yogurt, sour cream, dill, parsley, garlic powder, salt and pepper, to taste, in a small bowl; set aside. 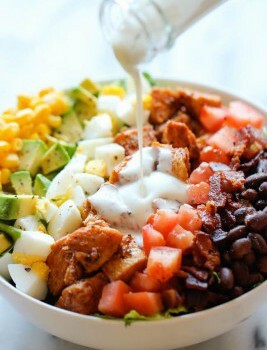 In a medium bowl, add chicken and BBQ sauce, and gently toss to combine; set aside. 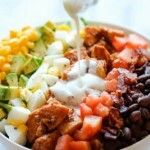 To assemble the salad, place romaine lettuce in a large bowl; top with arranged rows of bacon, BBQ chicken, eggs, tomatoes, avocado, corn and beans. Serve immediately with buttermilk ranch dressing.